Denise Chávez is executive director of the Border Book Festival in Las Cruces. She is the author of Last of the Menu Girls; Face of an Angel; Loving Pedro Infante; The King and Queen of Comezón; and many other works. Rick Hendricks was named State Historian for New Mexico in 2010. He is the author or co-author of over fifteen books concerning the history of New Mexico, focusing on the Spanish colonial period. David Ray, a resident of Hillsboro and Tucson, has published more than twenty books of poetry, including Hemingway: A Desperate Life; After Tagore: Poems Inspired by Rabindranath Tagore; and The Death of Sardanapalus and Other Poems of the Iraq Wars. M.H. ‘Dutch’ Salmon is the publisher of High Lonesome Books in Silver City. His writings deal with outdoor pursuits and human relationships with nature and include books such as The Catfish as Metaphor; Gila Libre! ; and Tales of the Chase. 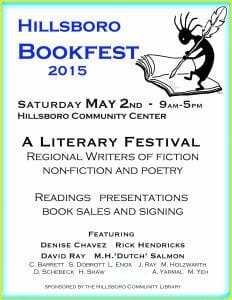 This will be an excellent opportunity to meet talented literary people and obtain signed copies of their work.